The Mediterranean Sea attracts thousands of tourists every year: Sicily, surrounded by the warm waters of this sea, is one of the most loved destinations. Eastern Sicily, in particular, is full of breathtaking shores: three beaches (Marina di Ragusa, Pozzallo and Ispica’s ones), in 2017, were awarded the Blue Flag, the seal of approval for good environmental quality and cleanliness given by the Foundation for Environmental Education (Fee). Many other towns of the area offer ideal shores for relaxing with family, having fun with friends or for romantic adventures. Let’s start from Marina di Modica, which features beaches with ultra-fine sand and a seafront that gets crowded with activities and events in summer. Modica’s bay is loved by surfers and windsurfers, even in fall. A bit far away from Modica there is a small fisherman village, named Sampieri: dunes protect its long beach, which expands all the way to the town of Scicli. At one end of the beach there are the ruins of an old brick factory, the Fornace Penna, one of the locations for the TV series Il Commissario Montalbano, based on Andrea Camilleri’s mystery novels. 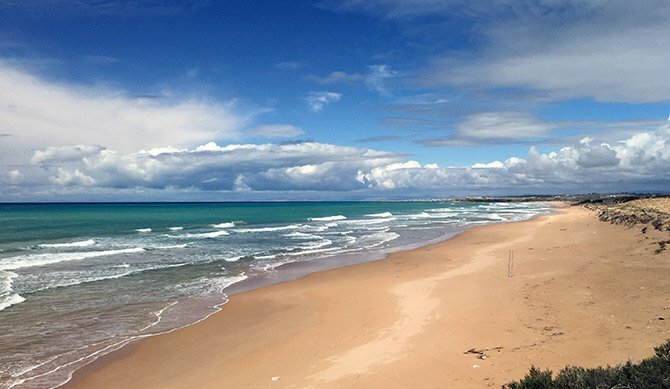 Marina di Ragusa has golden sand beaches: in the past, it used to be a fisherman village. Today, it has two seafronts, the Lungomare Andrea Doria and the Lungomare Mediterraneo, rich in restaurants, events, activities and tourist attractions. 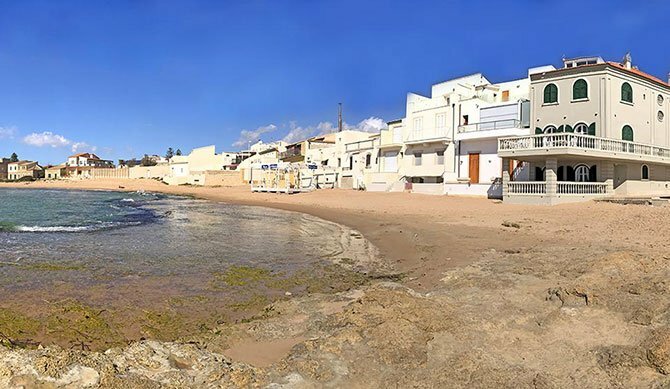 You can go and visit the popular Commisario Montalbano’s house, from the TV series, overlooking the beach of Punta Secca, a small village not far from Marina di Ragusa. Pozzallo’s coastline is 5 kilometers long and it has beaches with African golden sand: the coast is lined with dunes and palm trees, interrupted by a rocky cliff. The town of Pozzallo reveals traces of Byzantine, Roman and Arab civilization. Thanks to the Chiaramonte Family, Pozzallo became a maritime commercial hub: a group of warehouses, called “Caricatore”, serves as testimony to that part of the town’s history and it stands on the coast with slides and wharfs, built for the docking of ships and the transportation of goods. On the Port of Pozzallo you can find the Torre di Cabrera, built in the 15th century by King Alfonso V of Aragon in order to protect the Caricatore. The final stop on our coastal tour can be Ispica: this Baroque town, whose ancient name is Spaccaforno, has a unique natural skyline thanks to its Faraglioni (sea stacks), rising in front of Ciriga Beach and Santa Maria del Focallo Beach. Santa Maria del Focallo has a very large sandy shore, about 8 kilometers long, and it is surrounded by lush vegetation, rich in acacias, where you can protect yourself from the sun and relax in the shadow. From here, you can see the Isola dei Porri, a small island with almost no plant life, except for leek plants (Allium Ampeloprasum). This island holds stories of pirates and Byzantines and today is protected as strict nature reserve. For all those people who choose to visit the beaches in Eastern Sicily, Modica is the best place to start: Edel, located in the heart of the town, is a hotel that offers its guests the unique opportunity to spend their holidays in a real historic Sicilian building. The traditional sense of hospitality of the Sicilians will be part of your experience at Edel: its guests can access a wide range of special services . For those who want to enjoy the amazing beaches of the areas around Modica, the hotel offers beach transfers, beach chairs, beach umbrellas and a fridge, for a food service that includes snacks as well as gourmet dishes. Enjoy a real luxury experience and these fascinating beaches on the Mediterranean Sea.